IgmGuru's Selenium web driver training class will make you an expert in selenium architecture and selenium 3.0 components. This course enables you to master the complete Selenium 3.0 suite and make you an expert in Selenium architecture and Selenium 3.0 components. In Selenium Online Training Course you will master the automation testing framework for web applications, TDD, selenium architecture, JaCoCo, TestNG, Sikuli. 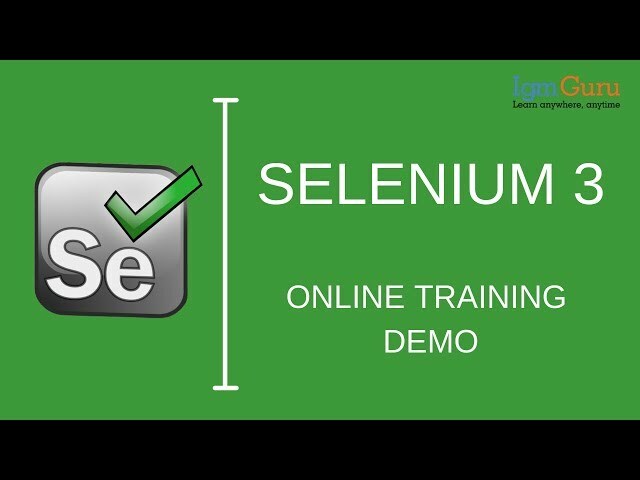 What is the focus of Selenium Online Training course? Selenium training has been designed to assist developers and manual testers find out how to automatize internet applications with a sturdy framework and integrate it inside the DevOps processes of a company. The course contains plenty of real-life examples and things to demonstrate the way to use Selenium WebDriver effectively. The training starts with a refresher course on core Java ideas and covers the fundamentals of test Automation and its importance within the business. The course includes basic still as advance ideas of WebDriver and different tools/frameworks like TestNG, Maven, AutoIT, Sikuli, log4j. Special focus is given on building a sturdy framework with Page Object style Pattern, Data-Driven Approach, and making reusable parts to boost productivity. The course additionally covers selenium Grid, that at the side of TestNG helps reach parallel execution to boost coverage and scale back execution time for faster feedback. Appium is an open source test automation framework to be used with native, hybrid, and mobile internet applications. Execute a task starting with no outside help by building a robotization system and mechanizing a couple of test situations. Basic Knowledge of Java is sufficient to opt for this course. 10.3 What Next? How to Start? IgmGuru's Certified Selenium Professional certificate is awarded once you complete the 40 hrs of online classroom training.